The myth, the legend, the legendary myth in a bottle of Rescue Beauty Lounge of the same name. Crazy RBLs hoard it, scalpers fence it on eBay, others lust after pictures of it and speak of its legendary color. And at long last, thanks to a second round of BIB voting, I now possess this color that has no equal. Yes, it is that amazing. Conceptualized by Scrangie (a totally awesome nail blogger) and brought to life by Ji Baek, this is a purple color with blue-green iridescent shimmer that mimics the sheen of a beetle’s wing. While I love that inspiration, the color reminds me of some crazy Wet ‘N Wild color nail polish that I *had* to have in high school and was all the rage. 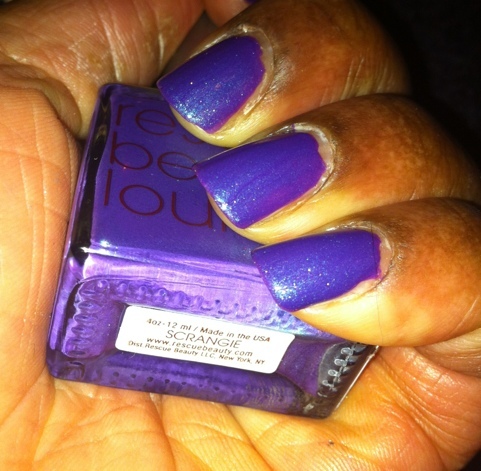 Prince references aside, wearing shimmery purple nail polish meant you were on the edge of fashion. Edgy like big hair, neon tights and mixing soda and Pop Rocks. This color goes on a bit sheer but builds up quickly. My swatches here show two coats and but as I love intense color I’d most likely go for three. No matter how many coats you use it is still stunningly beautiful. 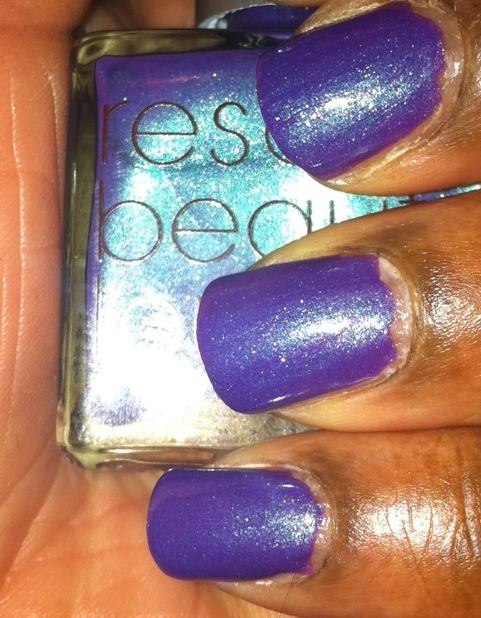 Wearing this color outside in bright light brings out the blue shimmer effect–just like a beetle in flight. The beautiful shimmer of a beetle's wing...now in nail polish form. So are you totally lemming for this? You should be. But don’t wait too long to purchase. Word on the ‘street is this may be Scrangie’s last ‘release’ so get it at retail while you can. She who hesitates will wind up auction sniping.